Google Sites is a structured wiki and web page creation tool offered by Google to help anyone create websites where people can collaborate and share files. 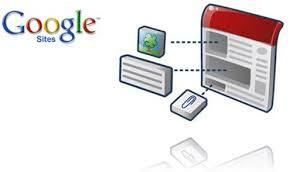 JotForm helps those who need customized web forms in their Google Site. 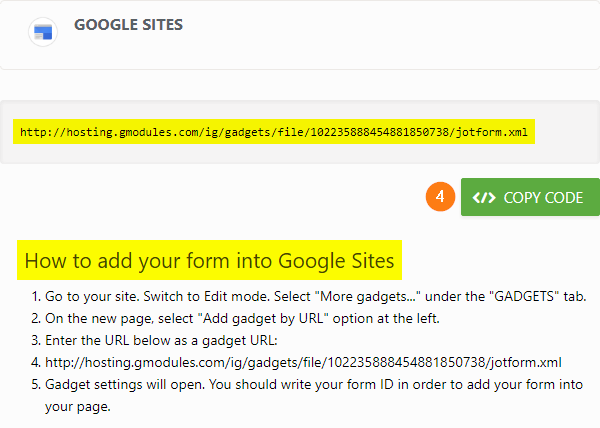 Watch the video or follow the steps below to add form to Google Sites. 1. On the Form Builder, click PUBLISH at the top. 2. Go to the PLATFORMS section. 3. Search for GOOGLE SITES then click it to open the publish wizard. 4. On the next page, click the COPY CODE button. 5. Now, go to your Google Site then switch to EDIT MODE. 6. Go to the INSERT tab then select ••• MORE GADGETS. 7. On the next page, select ADD GADGET BY URL on the left. 8. Paste the gadget URL you just copied from your Form Builder. If you wish to set your form background to be transparent, have a look at our guide on Making the Form Background Transparent. How'd you do? Did you have any difficulties adding a form to Google Sites? Please share your thoughts, recommendations, anything in the comments section below. thanks for the nice information I have added here you can check it. Nice post. Is there an easy way to auto resize the form for viewing with a mobile phone? I find the view is great through a PC, but get's cut off when viewing with a mobile phone. Can I still use the gadget if I want to collect something like DL numbers because the http gadget doesn't matter because the form itself is https? 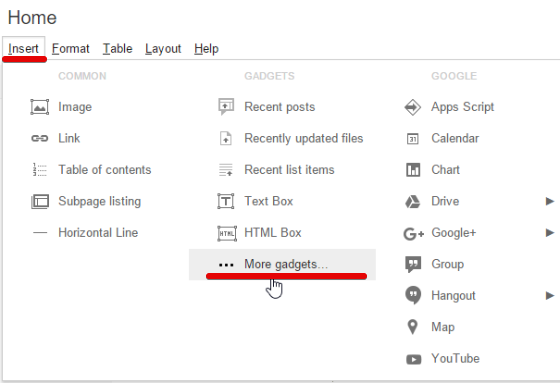 There's a way to add a jotform in the "new" google sites? What about the answers in google sites, how do i will receive? In a email message or google sheets? i can't able to locate html box in insert menu, is there any pricing for that? Is there an easy way to auto resize the form for viewing with a mobile phone? I find the view is great through a PC, but get's cut off when viewing with a mobile phone. I am currently using a form within a Google site. This worked perfectly, even better than embedding Google's own form! This product is an excellent middle ground between Google Forms and a full blown shopping cart product, and infinitely more flexible. LOVE IT! Дольшое спасибо Вам за совет. ВСе прошло замечательно. does not work for me ! I cannot add feedback form to my google site. What can I do? So why is the form id a secret with no information about how to find from id? I have tried this repeatedly and followed your instructions. No matter what I do, a foreign language contact form appears instead of my email address signup. I found it simpler to copy the URL into a iFrame wrapper Gadget - worked like a charm. It'd be great if it worked. What about an SSL version? How to disable Form fields based on dates? Zapier: Is there any way I could sync forms with Google Calendar? How to Change the Map Address Using the JotForm Contact Form with Google Maps? How is it the Contact Form appear in the search engine?